57. The Ultimate Official Foolproof Can’t-Miss Strategy for Winning Your NCAA Tourney Bracket Pool* | Burtogram. Delivering knowledge, laughs, and random facts for the world to enjoy. Est. 2012. March Madness is here! [For the uninitiated this means the NCAA men’s basketball tournament where 68 teams face off to become national champion.] The annual articles of teams that were snubbed, expert predictions, and lost productivity have already begun circulating. It also means that millions of people will sit down over the next couple of days to complete a tournament bracket and attempt to win their office/friends/family/Warren Buffett’s Billion Dollar Bracket Challenge pool. And whether the stakes are pride or a billion dollars participants are always looking for the ultimate official foolproof can’t-miss strategy for winning. If you are reading this article, I have good news for you. I have found the answer and I am willing to share it with you. For free. No postage and handling even. Are you ready? 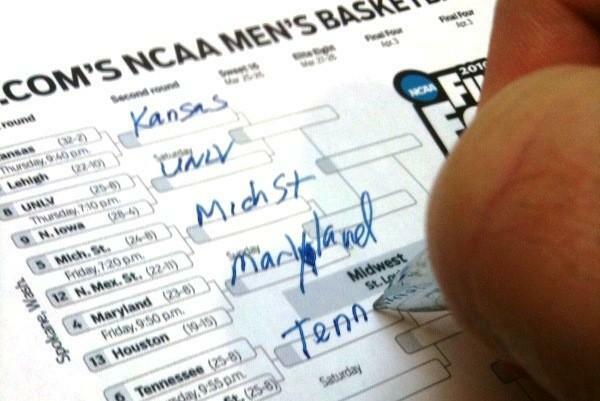 *The ultimate official foolproof can’t-miss strategy for winning your NCAA Tourney Bracket Pool is: sheer-dumb luck. They may brag about a team’s RPI or BPI ranking, or Las Vegas bookies’ odds for each team to win the tournament. They may even look at articles that detail the strengths and weaknesses of every team. While this data is very informative it all has one thing in common: it tells the story of what happened in the past. Perhaps the trends will continue. Maybe the experts will be right. But nothing is guaranteed. It only takes one upset, one difference, to change everything. That’s why they call it March Madness. So employ whatever strategy you like. I just hope luck is on your side.